Many Americans seem to have persuaded themselves that discrimination is a thing of the past, according to a Yale study out this week. It’s a case of fantasy superseding the real dream of equality. Just ask Colin Kaepernick. 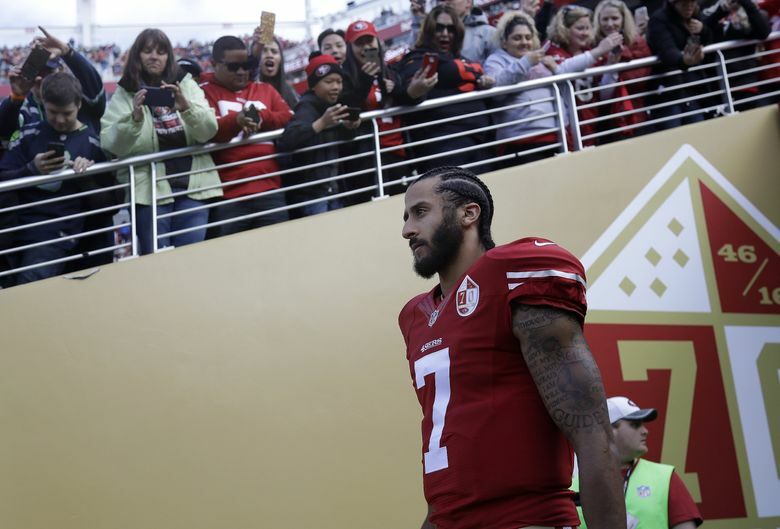 The San Francisco 49ers were in town Sunday playing the Seahawks, and I kept thinking about Colin Kaepernick and how people have reacted to him. Even if you don’t follow sports, you probably know that Colin Kaepernick used to be the quarterback for the 49ers. You’d know about him because last year he began kneeling or sitting during the playing of the national anthem at the start of each game to protest inequality and police violence against black men. The protests he started are being carried on by other athletes, including the Seahawks’ Michael Bennett. But they’ve not been supported by the league, and many fans object to athletes speaking out, especially by sitting during the anthem. Many people still don’t see the problems that Kaepernick is trying to bring to Americans’ attention. That is because it is comforting for many Americans to believe we have progressed to something approaching equality. Researchers at Yale University asked people to compare how black and white Americans were doing in relation to each other on a number of economic measures recently. In a report this week, the researchers said most people far overestimated how close to equality the two groups are. There’s a good article on the report in The Upshot feature of The New York Times. For every $100 earned by white families, black families earn $57.30. And for every $100 in wealth held by white families, black families have $5.04. Yes, go ahead and read that again, because if you’re like most Americans, you probably think the gap is much smaller. In the study, Americans placed both black wages and wealth at a bit over $80 for each $100 in white wages and wealth. Americans overestimate the progress that has been made closing those gaps. The gaps were smaller when white and black people with the same education level are compared, but the two groups are still much further apart than most of the people in the study guessed. Black people also thought the gaps were somewhat smaller than they are. Higher-income white people went furthest in underestimating the white/black wage and wealth gaps. The gaps exist because there are still barriers to equality. The article mentioned continuing discrimination in hiring and disparities in mortgage lending. Access to a high-quality education and health care are also still issues. Yet, many Americans, one of the researchers said, seem to have persuaded themselves that discrimination is a thing of the past. Some people go even further than that. In Monday’s column, I wrote about a study that found a significant percentage of white Americans believe that they are disadvantaged. Donald Trump benefited from the support of people who are in that group. Emails this week in response to that column included a couple of readers who wanted me to point out that black people can be prejudiced, too. It’s easy to get confused on this point, because people so often talk about racism as a matter of individual bad behavior, and anyone, regardless of how they are classified, can behave badly. The problem we as a nation need to address, though, is the legacy and ongoing impact of white supremacy. It can manifest itself in individual prejudice for sure, but it is also systemic and deeply affects the life prospects of whole groups of people across generations. It gives advantages to white people while negatively affecting other groups in varying ways. We’re not dealing with groups that are equal in their power to affect one another. The people who are most often in a position to make decisions about hiring, pay, policing, and so on are disproportionately white. Kaepernick never got a job offer from a team this season, though several were desperate for a quarterback. The guy playing quarterback for the 49ers this year, Brian Hoyer, is on his sixth team and has a quarterback rating of 60.7 so far this season and 83.6 over his career. Kaepernick had a 90.7 rating last year and 88.9 over the course of his career. People who don’t understand the degree to which racism is a problem can dismiss Kaepernick as a troublesome guy, or believe he’s just not that good, even though players with lesser credentials are playing. It’s not comfortable contemplating just how unequal our society still is, but comfortable people don’t change. That’s why we need people who will stir the pot when it’s necessary.